Qatar Airways today officially introduced an incredible line-up of globally renowned chefs to their unrivalled 5-star service, with the award-winning Chef Ramzi Choueiri, Chef Vineet Bhatia, Chef Tom Aikens and Chef Nobu Matsuhisa inspiring an entirely new inflight dining experience. At a press conference in Doha, Qatar Airways Chief Executive Officer Akbar Al Baker hosts the airline's new culinary dream team of internationally-acclaimed chefs inspiring new-look menus and cuisine from around the world. 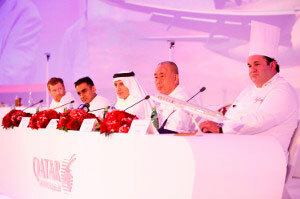 From left: Chef Tom Aikens, Chef Vineet Bhatia, Qatar Airways CEO Akbar Al Baker, Chef Nobu Matsuhisa and Chef Ramzi Choueiri. Handpicked to set a new standard for dining in the sky while representing the finest international cuisine from every corner of the world, the all-star team of culinary ambassadors has collaborated exclusively with Qatar Airways to create the ‘Qatar Airways Culinary World Menu’ – a new range of tempting signature dishes to satisfy the tastes of the airline’s discerning passengers. Chef Ramzi, from Lebanon, brings his exquisite experience of Middle East cuisine to the fore; Mumbai-born Chef Vineet has his unique blend of exotic Indian food; Chef Aikens, from the UK, provides his own variety of European culinary offering; and Chef Nobu, from Japan, adds a touch of Asian fusion cuisine to Qatar Airways’ ambassadorial line-up. Qatar Airways Chief Executive Officer Akbar Al Baker, pictured centre, and the airline's new culinary dream team from left – Chefs Tom Aikens, Vineet Bhatia, Nobu Matsuhisa and Ramzi Choueiri addressing media from around the world at a press conference held at the Al Ghassar Resort in Doha. Having been selected to create a unique and diverse menu for all international flights, the renowned chefs spent several months adapting and testing their specialities for Qatar Airways’ passengers. Their menus have begun to be rolled out on flights to and from Doha International Airport. Qatar Airways CEO Akbar Al Baker, pictured left, with esteemed Japanese chef Nobu Matsuhisa at the airline’s launch of its culinary ambassadors in the Qatari capital Doha. The chefs took into account not only the flavours, textures, arrangements, aromas and tastes required for a memorable dining experience, but also how the taste buds are altered at 35,000 feet, and what types of food are most suited to long-haul flights. The highly celebrated team consists of chefs that have gained a distinguished list of accolades including, multiple Michelin Star winners, multi-award winning authors, TV broadcasters, successful restaurateurs and even a Guinness Book of World Recorder holder. With each chef specifically chosen as a master of their own local cuisine, Chef Ramzi Choueiri was chosen as the culinary ambassador for the Arab World. One of the most popular and widely recognised chefs in the Middle East, Chef Ramzi has brought Lebanese cuisine to the masses with a daily live TV cooking show with over 10 million television viewers. Speaking at the press conference in the Qatari capital, Chef Ramzi explained his pride in being given the opportunity to work with Qatar Airways and the chance to take his unique style of Lebanese cuisine to the world. “Since food reflects the traditions of a society, representing the Arab World, the home culture of the airline, is an exciting challenge and I’m extremely honoured to be involved. Arabic food is a melting pot between traditional recipes, new techniques and new methods so it’s always ready to be discovered whether you’ve grown up on traditional dishes or sampling for the first time,” he said. International media attend the launch of Qatar Airways’ dream team of international culinary ambassadors. The second member of the chef team is the internationally renowned and multi-award winning Chef Vineet Bhatia, the only Indian chef to have won two Michelin stars. Describing his passion for cooking while showcasing his signature dishes in Doha, Chef Vineet said: “My cooking comes from the heart. The third member of the all-star line-up, Chef Tom Aikens, has quickly risen to fame to become the youngest British chef ever awarded two Michelin stars by perfectly combining British and French influences. Renowned for exploring unique flavours and tastes, Chef Tom explained the need to push boundaries. Internationally renowned chef Vineet Bhatia demonstrates his culinary talents in front of the international media at a press conference hosted by Qatar Airways. The final member of the exclusive team responsible for Qatar Airways Culinary World Menu is Chef Nobu Matsuhisa – a culinary icon around the world, simply known as Nobu. With a reputation built over three decades for cuisine blending traditional Japanese cuisine with South American ingredients, Chef Nobu has earned two Michelin stars and the admiration of thousands that he has introduced to Japanese cuisine through his line of 29 restaurants in 25 cities, spanning across five continents. At the launch of Qatar Airways’ Culinary Journey in the Sky global menus, in which the airline revealed its international panel of esteemed culinary ambassadors, media from around the world were flown into the Qatari capital for the special event. The exquisite gourmet offering, already available on selected flights, will be introduced to passengers onboard the airline’s new Boeing 787 Dreamliner when the next generation aircraft starts flying in Qatar Airways’ colours in the coming months. Qatar Airways has seen rapid growth in just 15 years of operation, currently flying a modern fleet of 111 aircraft to 118 key business and leisure destinations across Europe, Middle East, Africa, Asia Pacific, North America and South America. Since the beginning of 2012, Qatar Airways has launched flights to Baku (Azerbaijan); Tbilisi (Georgia); Kigali (Rwanda); Zagreb (Croatia), Erbil (Iraq), Baghdad (Iraq), Perth (Australia) and Kilimanjaro (Tanzania).